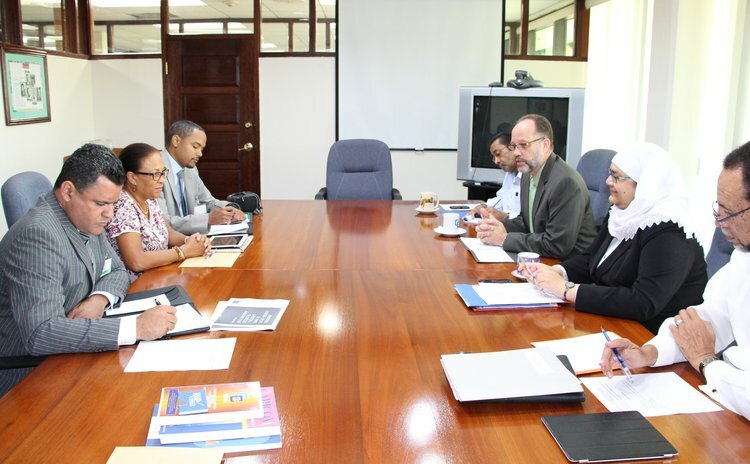 (CARICOM Secretariat, Turkeyen, Greater Georgetown, Guyana) CARICOM Secretary-General Ambassador Irwin LaRocque met on Wednesday 11 January 2015 with a delegation from Guadeloupe, which is one of five Caribbean territories which have applied for Associate Membership of CARICOM. The delegation from the Regional Council of Guadeloupe comprised – Thérèse MARIANNE-PEPIN, Président of the Commission on Cooperation, Olivier SORET, Director General, Europe and Cooperation and Lionel SAROTTE, Cooperation Officer . The Secretary-General held broad discussions with the delegation, focusing on the structure and operations of CARICOM, the role of Associate Members in the Community and the terms and conditions of Associate Membership. This meeting with the Secretary-General follows meetings with delegations from Curacao, Martinique and French Guiana, which have also applied for Associate Membership in CARICOM. A meeting is also planned with St Maarten, the fifth territory which has applied to CARICOM for Associate Membership.